I am so happy to share this guest post by my friend, Julia G. Thompson. 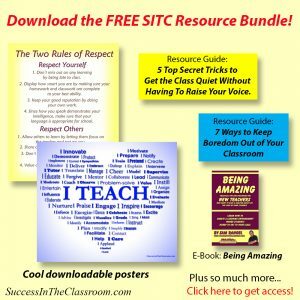 In this post, she shares some valuable information on how to have success in the classroom, especially when you have challenging students. The discipline problem many teachers dread most is students who are defiant. These angry students can be loud, abusive, and confrontational or they may resort to muttering, showing disrespect, and refusing to work. Defiant students have a serious impact on the positive discipline climate in any classroom. 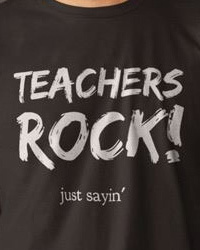 Not only do they cause trouble for themselves, but they can perplex even the most caring teacher. 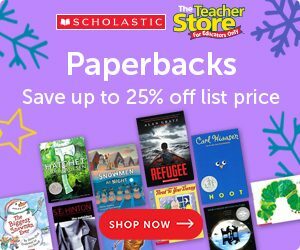 The worst damage they do, however, is to the other students who watch the out-of-control behavior of their defiant classmates and wait to see what steps the teacher will take to deal with it. There are many things you can do to prepare yourself to successfully manage these students before they lose control and then to help them once an outburst has occurred. Use the following strategies to prevent defiant students from taking control of your class. Many problems with confrontational students can be prevented or minimized with early action. Monitor the emotional weather of your classroom as students enter the room and continue to do so throughout class. If you see that a student is frustrated or upset, offer help and support as quickly as possible. Too often we are so intent on delivering the lesson that we tend to ignore the unmistakable signs of stress in our students until it is too late. How can I tell when I should act? Where will I send an angry student to insure the safety of others? What signs should I pay attention to that will let me know a problem is brewing? Which of my students is already heading in this direction? What can I do in class tomorrow that will ease some of the stress that my defiant students may be feeling? Although you should take an angry outburst or other sign of defiance seriously, you should not lose control of your own emotions and of the classroom situation. Keep your voice low. Keep your face neutral. Do not give into the temptation to threaten the student. Wait a moment or two to gather your thoughts. Often this brief delay will allow the student to calm down. You must act calmly and quickly because the student has forced a showdown with you in front of the rest of the class. Those other students are now involved in that they are waiting to see what steps you will take to deal with the student and to protect them. You should show you are serious, concerned, and in control. As quietly and calmly as possible remove the defiant student from the room. Do not allow your consternation and stress to show. Be as quietly matter-of-fact as possible. Using a low voice to ask the student to wait for you outside is much more likely to generate a positive outcome than dramatically demanding that the student leave. This will not only keep the disruption under control, but will also save more embarrassment for the student who has misbehaved. You cannot help a defiant student in front of an audience. When you begin to work with defiant students, acknowledge their feelings of anger and frustration as quickly as you can. While these are not an excuse for bad behavior, the student needs for you to pay attention to the reasons why the outburst happened. Once a defiant student can see that you are not angry or acting in haste, then that student can calm down enough to listen and talk instead of just reacting in anger. After this important first step, deal with the outburst and its causes. This will eventually lead to solving the problems that caused the defiance. If you have a student who persistently speaks to you and to others in a rude or inappropriate tone, record that student so that he or she can hear how it sounds. A tape will also allow you to focus on what actions you do that may trigger the rudeness. It is up to you as the adult in the classroom to make sure you have a positive relationship with all the students in your class, even those who are confrontational or defiant. One of the best discipline tools any teacher can have is a positive relationship with students. Because all students need to be treated fairly, the same standards should apply to every student in your class—regardless of whether a student is frustrated or not. A graduate of Virginia Tech, Julia G. Thompson recently retired after forty years as a classroom teacher. Today she works as a teacher trainer for the Bureau of Education and Research and is a blogger for BAM EdWords and AFT’s Share My Lesson. 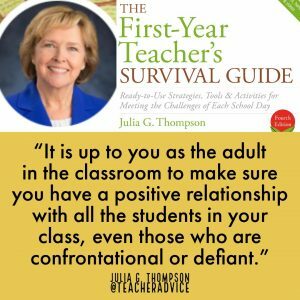 Author of Discipline Survival Guide for the Secondary Teacher, First-Year Teacher’s Checklist, The First-Year Teacher’s Survival Guide, Thompson also provides advice on a variety of subjects through her Web site, www.juliagthompson.com; on her blog, juliagthompson.blogspot.com; and on Twitter at https://twitter.com/TeacherAdvice.